The heavily wooded site is master planned to accommodate two houses affording maximum privacy to each. 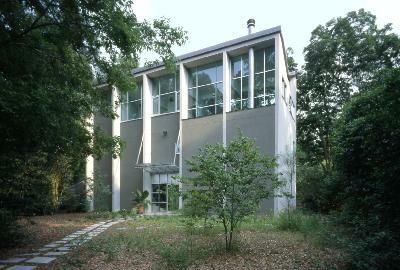 The initial 2,500 square foot house for a couple with near mature children is designed to take advantage of the views through the trees toward the natural bayou landscape, as well as views toward downtown from upper level decks. Main living occurs on the second level with a separate living unit on the ground and the master bedroom suite on the third level.